Still learning about iPhone to iPad when you have a code in a wifi situation. Words vanished but picture went. 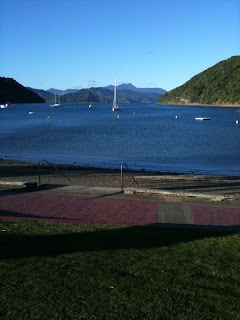 This is Picton after we got off the inter islander ferry and sat by the sea having fish and chips before we drove to Reefton. The trio across from Wellington was the calmest I have ever experienced - water like a millpond. Got to Reefton at 11pm and slept in until 10.30am - the weary travellers at the end of a long day. 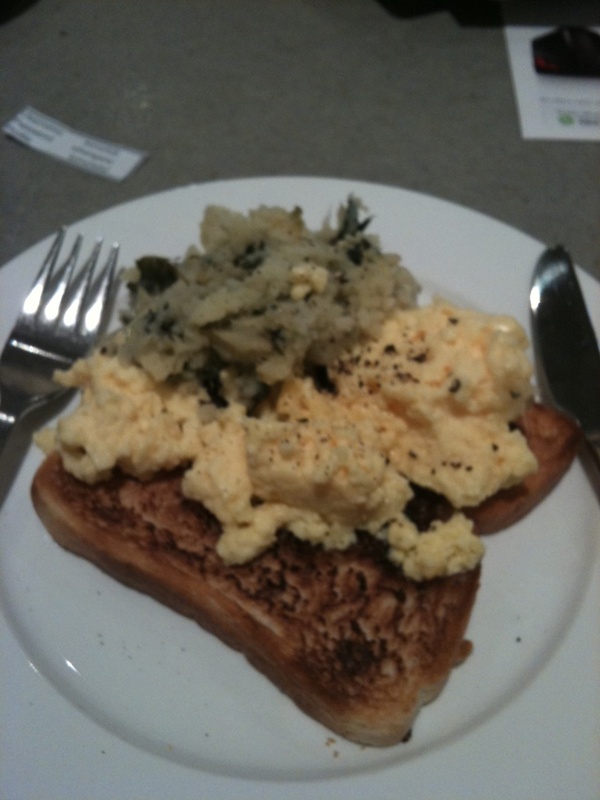 Breakfast in the Koru Club in Auckland at a time when we would normally be asleep. Note that we have real knives and forks. Yes - it's that time of the year and for those who haven't seen this photo before (I must find a new one for next year) - this is us 42 almost years ago when I was but 19 - and yes it is all my own hair and yes I made my dress with a long train, covered buttons and roulade to loop them all up down the back and my father was thrilled because he didn't have to buy one although he was never happy about my shoe purchase (yes I have always loved shoes) and as you can see Ian had hair too. Well what this means is that we are off to NZ tonight for dinner on the 30th in Wellington (my favourite city in the world) and back on 1st. 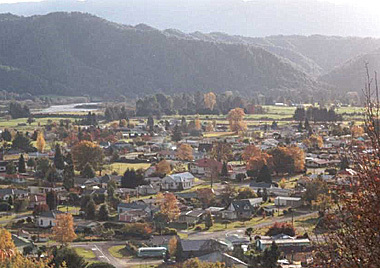 Our trip is a bit of a hop because we fly to Auckland, wait 5 hours, fly to Wellington, catch the ferry to Picton and collect a car to drive to Reefton on the West Coast. The reason for the hop skip and a water trip is because we booked this ticket when we were in Madrid and got home to find that the Leonard Cohen concert was on last night so at great expense I closed my eyes and paid the punishment price to change the flying date. The concert was worth it all - what a fabulous night - such consummate musicians and we loved every minute and it was a good morale booster as well. Many thanks for all the wonderful emails and comments - we both appreciate it very much. 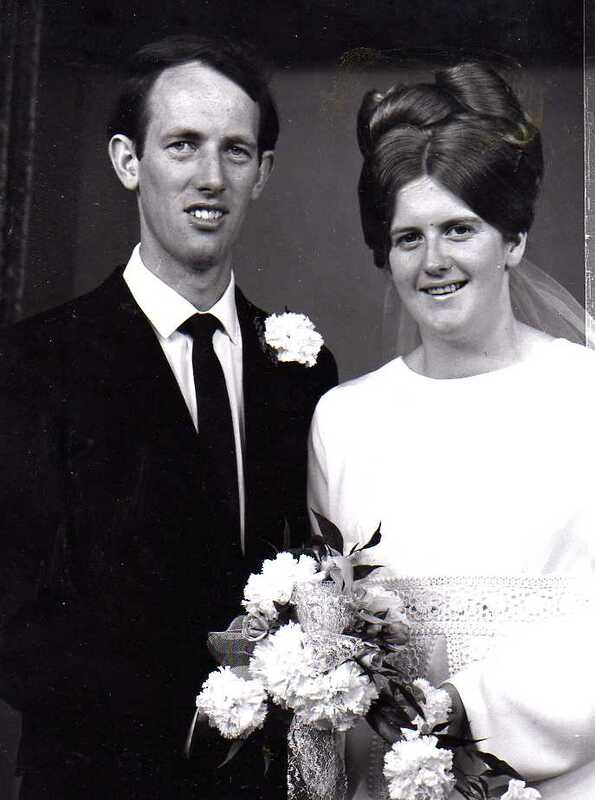 I am not a West Coaster but I have been priviledged to have married into a fabulous West Coast family - Jean and Frank (who was a coal miner) - my inlaws - were the most wonderful people and the coast is a special place to visit. The first time I went I did discover that they are different from the rest of New Zealand - they had the wrong idea of what a whole and half a loaf of bread was for starters..... at the moment they are hurting badly and things will be difficult for a long time. I-pad/I-phone further dramas. Yesterday I went to the Apple store and bought a connection so I could load my camera into my new i-pad. First the camera chip would not go in and after a long hunt Ian found the cord. So far so good. Took a photo and successfully loaded it and thought I would test blogging and adding photo. Oh no - i-pad doesn't support blog writing unless it is in html and no photos can you upload. Hair pulling time. Ian went for a walk as he couldn't stand it. Lots of web searching later I discovered that I can blog and send photos from my i-phone (I could have been doing this all along...) so for this trip - i-phone comes for taking pics, writing blog, phoning and i-pad for receiving and sending emails and maybe reading a few of the books in my library - Winnie the Pooh, Alice in Wonderland, Sense and Sensibility and looks like Grant has loaded Plato and Issac Newton. Not so sure about that. A very sad day today - when people were still full of hope a second explosion happened at Pike River. 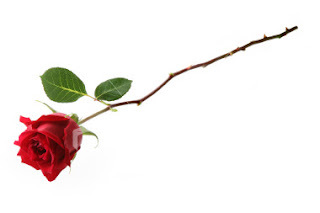 This rose is for Kane, his wife and children, for Barb and Brian and all the rest of the family, for all the families, for the West Coast, for all of New Zealand and for anyone else involved in the dreadful tragedy. I forgot to mention the other day that we went to the opening of the Designing Women exhibition - Rich in Stitch. 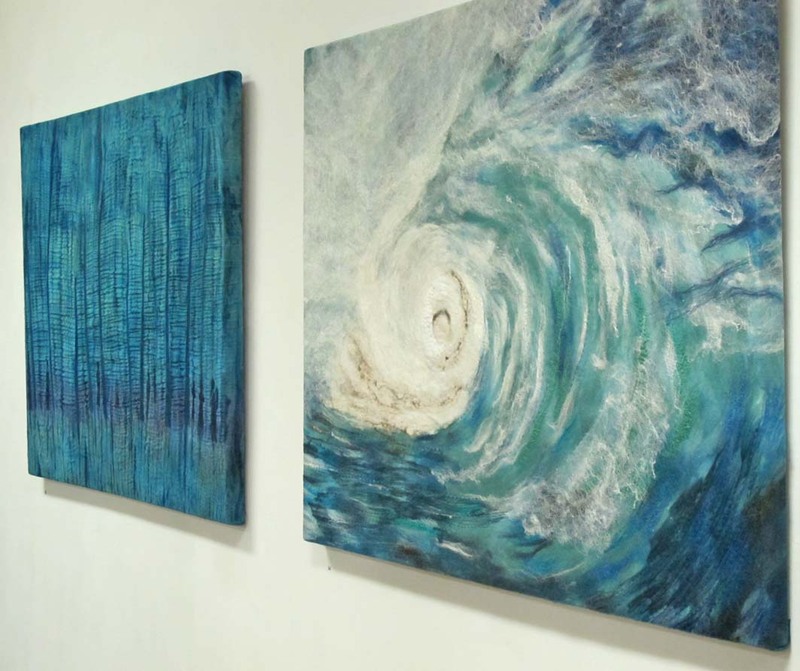 There is some excellent work to be seen - some very talented ladies. I have stolen a photo from Joan's blog of Juliet Hargaves 2 pieces - I hope you don't mind Joan. As usual I forgot my camera - if I took my handbag then I would have my phone but then I might leave my handbag somewhere - sort of a hen and chicken situation. I also loved both of Juliet's other works as well. Plus there were lots of others - so if you are in Perth, do go visit. I am working with puff paint again this week - on different usrfaces and with different media. Always exciting to see what happens. Thought I would show my weekend's gardening - not much really but I have been planitng herbs and stuff and stacked them all together so they get water and anyway it is always nice to sit out amongst the herbs and smell those that do. I am a little late with planitng basil so hope that 2 pots means we will get some - I use it a lot. this is the other side of the decking where we like to sit - there is a tomato somewhere as well. They get plenty of water now that Ian has set up his new trusty system. And our lime tree (thanks Bruce and Kazuko) which has lots of little limes I hope and our lemon tree which has bigger lemons. There's a lovely little curry tree too which I love the smell of and we use it in lots of our curries. Another little playing with deColourant - using a screen I bought at Ally Pally - I left one part just the gel and the other I added some yellow paint - the continuing possibilities are enormous. Yesterday we had a temperature of 39 and it still isn't summer and today is sticky but better and it might rain. I have finally been off to the nursery to buy my herbs and veges - planting in pots. We have the plan for the back garden but it might be a while until the landscaper can do it especially at this time of the year but we are really pleased with the way the front garden is beefing up apart from the spaces where the kangaroo paws will need to be replanted. This is the time of the year when nature does its thing and the bark falls off the eucalyptus trees - the changing colour is always wonderful and then the trees are bare and smooth - only thing is the bark falls everywhere and we have to run around and collect it up - one year I really pulverised it for paper making but it was a lot of work and I had to soak it in caustic soda for quite some time. Don't think I will this year. The pattern on this tree outside the studio loks a little like the edge of my kunin felt having attacked it with my Versa Tool. Nature has so much to teach you. It's quite amazing really is nature. Grant is down from Singapore for the weekend and he brought me a lovely surprise - my christmas present rather early - an i-pad. Lots more to learn and of course my i-phone has decided to play up once again so it might have to go to hospital on Monday. I am a very spoilt girl for sure. Off to watch the rugby tonight - the Wallabies are playing Italy and then we will have a news black out and watch the All blacks in the morning. It's pretty terrible news about the Pike River Mine - we drove past there on the way to Reefton in August - a very anxious time for everyone involved in the rescue. This morning I said I was off to play in the studio and I did actually get there and do a few things. I have been playing some more with the de Colourant, adding my own paints to it to see if they worked and i was pleased witht he results. Because the Opulent paints from Kraftkolour are available again, i have been desperate to play with them some more. They have new packaging so I will have to use up my old ones so I can have some of the new ones. I dutifully made a proper colour chart at last for Ian to pop on the web and then I got to play. The little sample at the top is a thermofax screen to which I have added some yellow paint. I used screens, stencils and stamps with de Colourant on its own and mixed with paint on hand dyed fabric.This one is a stencil - the top was quite heavily rubbed through with just the de Colourant and I used my fingers becasue I had a bit of a mess in front of me and couldn't see anything else. In the bottom part I mixed light gold paint in as well. I have washed these and the handle of the fabric is very good. I used another screen here and added a little pearlised paint this time. I also played with stamps but have yet to iron these ones. I am pleased with the results and I think it would be worth trying whatever paints you have in your collection. As well as that I am working on lesson 1 for Hot Needles, Cool Stitches - my next stage embellisher class which will start, I think, in January.I have a loads of samples at different stages and I know people are waiting.I am also getting The Holey Moley Club info ready to go on the web. I can't decide whether to start in January or March. There will be 6 workshops full of lots of things including a guest running for 2 months each. Finally - with regards to Down Under Textiles #3 - weh ave had half of our order delivered by Aussie Post - the other half is coming with a courier (one we would NEVER use and I am surprised they used them again after the last debacle). Apparently they shuold be here Friday but maybe Monday - what this means is that half of you will not have your mags - I suggest you get creative while you wait! I have been quite determined to finish this little sari ribbon book. No doubt I will now think of lots more things you can do with a hank of sari ribbon (that's not true - I already have many other things you can do but not for this little project). Doesn't the ribbon look great unravelled? Ironing the hank takes longer than anything else but you can dip in from all over when you need specific shades. We have nearly sold all of this colour range but there should be a new big shipment here in the next couple of weeks - takes a while because they overdye the sari ribbon. I think I have chosen about 10 different sets of colours/shades. Part of one page - the green pops up and it great. Front cover - that is the cord of my trusty Versa Tool because I simply had to make flower stitch circles on kunin felt to feed my cords through. Can you see the dear little button hole rings on the page? I found a few more in my stash so have packets to sell - they sold out very fast at AQC this year andthis really will be the last of them. Some twin needling here and some more of the little buttonhole rings - they are vintage ones which I have sprayed with Moonglow sprays. One of the things about the sari ribbon is the myriad of colours which are in each hank. Sometimes they look like nothing when you pick them up but once you start unravelling them it is pretty exciting. Last night we had a bbq and then went indoors to read our books and promptly fell asleep - fortunately Jonathan phoned us as he and Tom were waiting at Grant's for us to arrive with the key and the chairs so we could watch the Wallabies/England rugby game. Grant has cleared everything out of his house as he has tenants coming in a few weeks and moved it all to his other house where work will soon be starting so all that is left are our wine glasses and now 4 deck chairs. England played very well - great running game - and I liked their costumes as well - much nicer than that white stuff - I think it makes them look thinner, fitter, faster etc etc. And they deserved to win. A little note for all the poeple waiting for Down Under Textiles #3 - I know you are all waiting because many of you have emailed me to see where they are. Last week we got an advance copy and we expected them last Friday - turns out they didn't actually leave Sydney until Tuesday this week so we are hoping like crazy that they will turn up on Monday. Bottom line is that the minute they arrive we will drop everything and get them processed and on their way. Totally out of our control but of course we apologise because I know so many peple have been waiting since September - the month it was advertised to appear. Never mind - be happy reading when they do arrive. 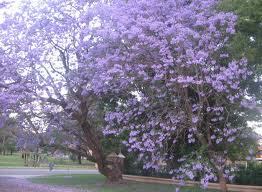 it's Jacaranda tree time in Perth and they are out in flower absolutely everywhere - except for ours - it has lots of leaves and is a lovely tree and we cherish its presence but it hasn't flowered for a few years now. So instead I enjoy all the ones out and about and appreciate the privacy it gives us in our back garden especially when we are sitting outside in the evening. Amazingly it rained yesterday and this morning . I will have to take back my words about dry dry although I don't think we will get much more. 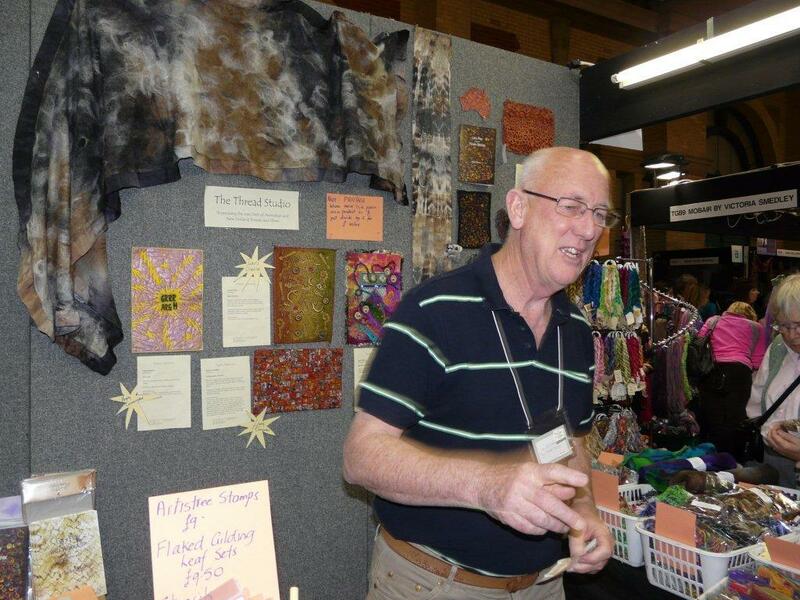 Ian has been working extremely hard today loading all the beautiful new Scottish buttons onto the web. There are cards of and single big ones and each is unique. I have chosen one for me so that one is not there but it will appear in some work before too long. This is a big square one. I have made very slow progress on the sari ribbon book and need to get working. today I seem to have been flat out packaging and stuff. Facebook has been keeping me busy - I linked to bloglines supposedly to my personal facebook but it has popped up on The Thread Studio one instead. Naturally I can't seem to remove it. That's my trouble - bull in a china shop. Off to prepare for tonight's bbq - a little cool and windy but doesn't matter. 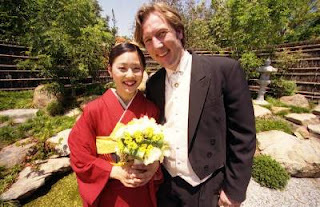 Kaz and Bruce - 8 years - that is a long time - hope you have a wonderful day - still both looking radiant. We will have a toast to you tonight. Very laconic here - must be the result of Grant having a birthday or is it the weather? He has gone back to Singapore now - plane was 2 hours late leaving - Qantas - who else? I promised to show more of what you could do with a hank of sari ribbon - I am making a book with the mushroom coloured one we sell. It's amazing the myriad of colours in one hank. 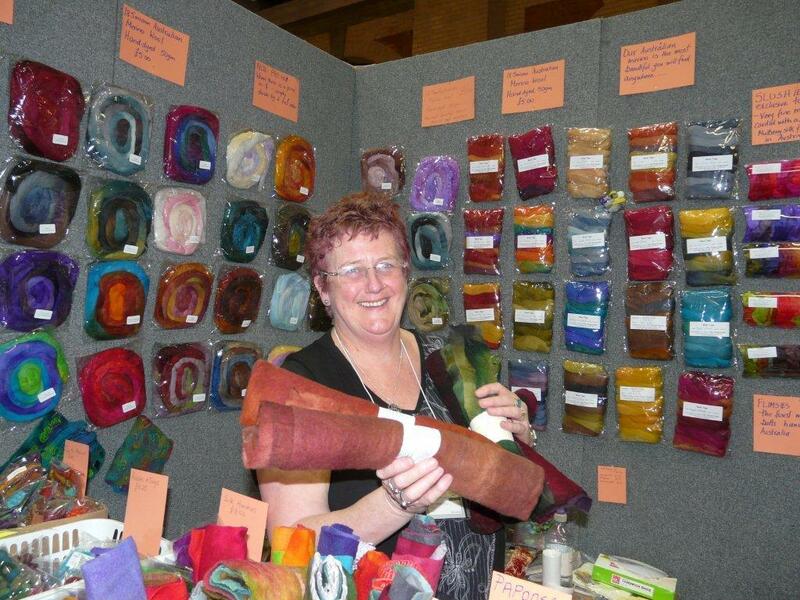 Can't wait until the shipment comes - takes a while becasue they are all hand dyed. but we do have this one of course. Not so easy to see but I did a sort of log cabin and cut it up. i am making the pages 2 sided so of course it takes longer than you think to make something which might resembel a little book. A pile of parcels today - some new goodies and some old but one was full of beautiful buttons from Scotland - in singles and on cards. They are wonderful and I shall encourage Ian to give them a priority for the web. All set in resin and washable. Just a tad yummy for sure and I know they will feature in my work somewhere. Mags (digital gran) took some pics of us at Ally Pally - here is Ian probably persuading a customer not to use her credit card - the rate sure was better if you could pay cash. This was early on day 1 so plenty of stock still. 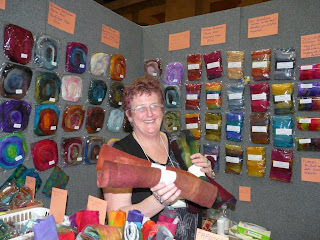 and I am holding a flimsie and they surely didn't last for long - that's some of out wool on the walls - the only place we can display it - pretty bare by the end of the show. Ann and Lexa - thanks for your lovely words - you know my secret - but I am so excited and honoured to be invited to teach. 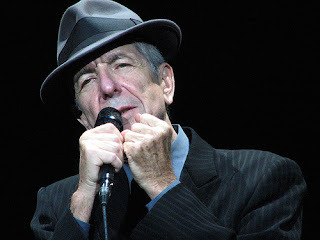 The time will pass pretty fast and soon be May 2012. It was indeed great to meet you, Ann, in London. Yesterday - Very frustrating times - both of my printers have been dead although they are now back in action and my email programme wouldn't allow me to reply and then it started sending me multiple (up to 20) of every email so in disgust I closed the system down and we had a bbq instead. As a result one of the POMs has not been sent yet and that one will go on Monday - sorry folks. Then because of the Qantas drama in Singapore (that is the connection we start from London and then hop out in Singapore and hop on the Perth plane), Grant's flight from Singapore was very late leaving and Ian had to set the alarm to go pick him up at 2.30am. I think as a result of these two happenings we have been fairly laconic today and I haven't finished my next what you can do with sari ribbon piece. Better get a move on. In 1992 when we did our BIG trip to Europe, our plane leaving Perth (only had 2 engines) lost one and we had to re-land without even dropping off the fuel. Think it was more serious than I realised - I was just annoyed because no-one had brought me a glass of wine for my big OE trip. However, like falling off a horse, you get back on quickly or you would never go anywhere. Grant is down for the weekend because it is a BIG birthday for him (he is growing old faster than we are) and tonight we are going out on the Swan River to watch the 18ft Skiffs twilight race. 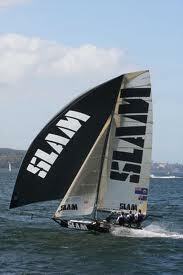 Hence the photo of Slam although he is not sailing but this is to remind you what his 18ft Skiff looks like. We went to Veritas for breakfast this morning as well. Better get back to work or we will be late for the ferry. Will have stitchy stuff for tomorrow. Shock horror you say! She has another pair of shoes? Well look at the soles of this new swanky pair.- and I didn't even see that when I bought them - I was just a little mesmerised by the change of colour and style but you can be sure that those soles will be in action before I wear the shoes out in the open so watch this space in days or so to come. Think stencil for starters. And I couldn't resist this card I saw in London. 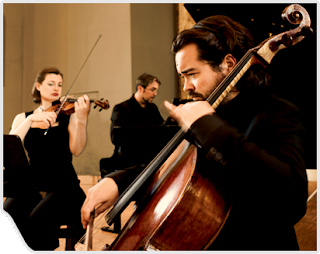 Last night we went to a Musica Viva concert which was fabulous. The 3 players were so connected and it was a lovely concert . 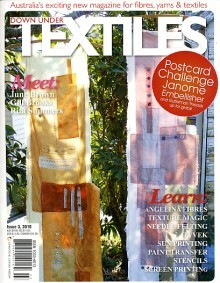 1 copy of Down Under Textiles 3 rocked up today - I am hoping that means that the remainder will follow tomorrow? So many people are waiting anxiously for it. I have a little article on stylish stencils inside the mag.